The season featured a very unusual end to the regular season. 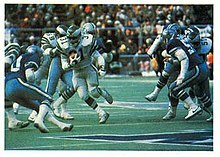 Going into the final week of the season, Dallas (11–4) played Philadelphia (12–3) at Texas Stadium. Under the NFL's tiebreaking rules, if Dallas could beat the Eagles by 25 points, they would earn the NFC East title and the number two seed in the NFC playoffs while Philadelphia would be a wildcard team. However, if the Cowboys lost (or won by less than 25) then the roles would reverse. Atlanta (12-4) had the number one NFC seed over either team in any scenario since they beat Philadelphia head-to-head and enjoyed a better conference record (10-2 vs. 9-3) over Dallas. Dallas led the game 35–10 in the fourth quarter, but the Eagles rallied to lose only 35–27. This forced Dallas to play an extra week in the playoffs and a road game in Atlanta in the divisional round. Dallas ultimately lost at Philadelphia in the NFC Championship game. Veterans Stadium during the 1980 NFC Championship Game against the Dallas Cowboys, January 11, 1981.